Great rug for the money. Thin but not rough. Good buy! 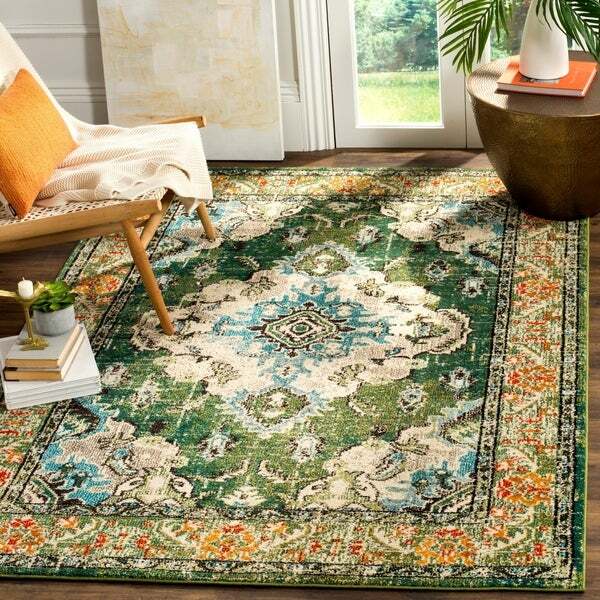 Safavieh Monaco Amelie Vintage Medallion Navy / Light Blue Rug - 6'7" x 9'2"
Safavieh Monaco Bohemian Medallion Forest Green/ Light Blue Distressed Rug - 5'1" x 7'7"
Safavieh Monaco Amelie Vintage Medallion Forest Green/ Light Blue Rug - 4' x 5'7"
The Monaco Collection makes a bold, resounding statement in restyling timeless mythical and classic motifs in avant-garde modern, flamboyantly colored floor coverings. This rug is inspired by timeless oriental motifs with a border and distinct bold oversized central medallion. Its deliberate distressed effect adds a trendy feel to any room, while its boho color combinations make a unique and artistic statement. Rug Size: 6'7" x 9'2"
I ordered this rug for a recently restyled room, while I was visiting my sister in California. What a treat to fly home to the rug, waiting to add to our room! The colors were not true to the original preview online, but the variation made it a better match! I absolutely love this carpet in our room, as do our pups, Toby and Cynder! Shipping time was reasonable and it looks fantastic in our living room. The corners laid flat within a couple days. The kids love playing on it and it is very soft underfoot. I haven't had to clean up any messes on it yet but the pattern and colors are busy enough to hide any stains that I can't get out. I sent my mother a picture of it and now she wants one, too. Colors are true to the pictures; it's a nice forest green with shades of amber, gray, cream, and blue. A wonderful rug for the price. The coloring of this rug is beautiful; the quality is excellent, also. I purchased this for my kitchen and it adds just enough color and the distressing keeps it looking clean...I would recommend this carpet 100%!! I love my rug so much, I still stare at it even months later! The colors are so beautiful, it's very unique, and it pulls in so many colors in my living room. The rug is thick and soft under foot. I've gotten several compliments on it and I will be buying more Safavieh rugs in this collection. Also, one of my kids knocked over a candle on our coffee table spilling wax onto the rug. I used a damp washcloth over the wax then a hot iron on top of the washcloth and all of the wax came out of the rug! Plus, the rug hides dirt that my dog tracks in daily. It's just perfect! I bought this rug for my main living area, i was grawn to the color combination of the deep green with touchs of orange. The colors are exactly true to the pictures and it looks absolutley stunning againgst hardwood floor. The texture is wonderful as well, very soft to the touch and feels great under your feet. If you are looking for a rug that looks expensive and elegant this will surely do the job. I am more than pleased! Softer than I expected with just a minimal rug pad to prevent slipping. If you want a really plus feel, I recommend the 1/4 " partly felt rug pad.My pad is thinner, but I'm satisfied. 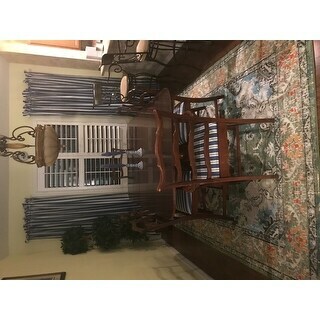 The colors are true to picture -deep green, some teal-ly blue, a touch of black to set off design, cream,and some touches of orange and pink.It is not bright,and flashy, but a aged,softer looked oriental rug. I like it very much. This rug is gorgeous. I was worried that the larger size would make the distressed look odd. I was pleasantly surprised at how beautiful it actually is. 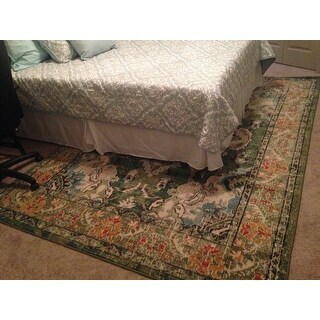 We used lost of rug tape to keep it flat, as it is partially under our bed and it worked lime a charm! Love the colors. Exactly as described by others. The color is lighter than I would think for Forest green, looks different from different directions. Ties together my eclectic Mid Century living room nicely. 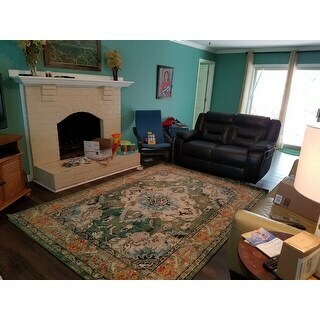 The colors are exactly as shown and the rug has met our expectations. The quality is exceptional. 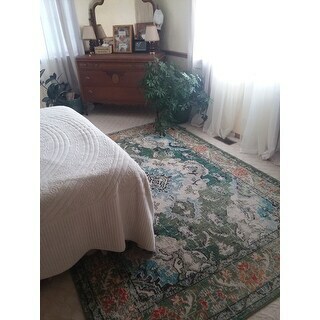 When my Mom saw the rug she told me how beautiful it is! I never get decorating compliments so that was definitely a sign I made an excellent choice with this rug. I can't wait to buy the other sizes to compliment it. It is beautiful. Love the colors they are just as pictured. I actually ordered this for a bedroom that had a lot of green in it. But once I saw the small amounts of blue I put it in my dining room. Great price. Not too thin and not too plush. So my table and chairs fit nicely. Want another one. I absolutely love this rug! We put it in our master bedroom and its really the focal point of the room. It matches the picture pretty well; maybe just a touch brighter in person. It adds a modern boho feel to our room. I highly recommend it. Love this rug,it's prettier in person than in the picture. I would order this brand again. I have animals so the vintage look is perfect ,it doesn't show anything. Love this rug! Safavieh rugs are my favorite, I love the different color combinations they use. Great selection too! It was shipped quickly & only took a couple days to flatten out. Nice bright colors, lays down nicely, is fine without a rug pad underneath. Great quality rug, better than expected. The colors are vibrant, but not over powerful. I have 4 dogs and 3 boys and the durability of this rug is just what I needed, yet still soft. Good quality- nothing like the pic. Same pattern, way more blue. It's not the beautiful green color that picture shows. This is a beautiful rug. It is very soft/has a nice texture, and the colors are great. It is bright enough to make a room look lively, but muted enough to not be loud or distracting. We are thrilled with this choice. It feels like it is very high quality, so I'm expecting that it will last for many years. Looks exactly like the photo, very happy with the rug. It has excellent color, a little bit of every color infact. Very soft. "Are the dark lines in the rug navy blue or black?" The straight lines are a very dark navy blue. Great rug! There are 2 different areas with dark colors. One is actually a blue and brown mix and the other is the same color brown with gray. Wish I could submit a picture. "Is this rug's surface a cut pile or tiny loops?" This rug is cut pile. I chose this rug because I love the colors and design. I have a green sofa and think the two will be lovely together. 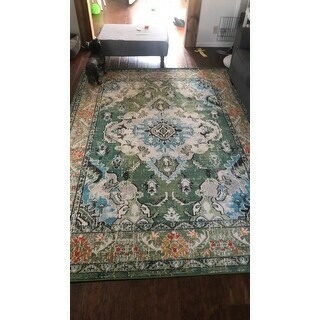 "the color in the picture is really nice but the video makes it look like it is very bright greens.....can somebody that has purchased this rug tell me which is closer to the color of the rug?" The green could be slightly lighter due to dye lot variations from production. It should not be too bright however. Safavieh Monaco Amelie Vintage Medallion Violet/ Light Blue Rug - 6'7" x 9'2"